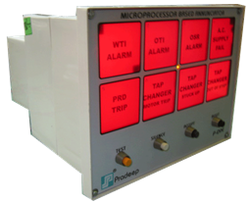 Backed by the support of dexterous workforce, we are able to manufacture, supply and export high grade Microprocessor Based Annunciator. 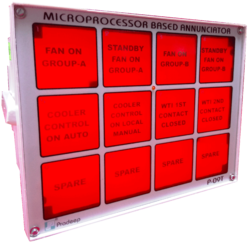 Under the offered range, we have 8 Window Annunciator, 12 Window Annunciator, 16 Window Annunciator, 24 Window Annunciator and Microprocessor Based Annunciator. Offered digital annunciators are used for facilitating different off shore installations and marine applications. In addition to this, provided digital annunciators are used for supervising alarms & signaling contacts in substations and power plants. With an aim to cater to the requirements of our valued patrons, we are engaged in offering high grade 12 Window Annunciator. 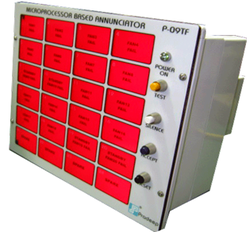 The demand of offered annunciator is high as it helps to maintain records of faults for analysis by storing the faults with time stamp memory. In addition to this, provided annunciators inform the operator about the occurred fault by ringing alarm and giving visual indication by LEDs. With sincerity and hard work, we have carved a niche for ourselves in this domain by offering optimum quality 24 Window Annunciator. The demand of offered annunciators is at peak due to their reliable performance. In order to ensure the same, we manufacture these annunciators using best grade raw material and modern technology. 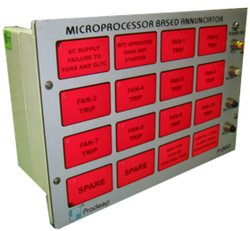 We are instrumental in offering best grade Microprocessor Based Annunciator. Patrons widely appreciate the offered annunciators as these are in-line with the globally laid quality standards. With an aim to ensure the same, we manufacture these annunciators by making use of the high grade raw material and latest technology. Our organization is widely appreciated for offering 8 Window Annunciator, which helps identifying occurred fault in any system/machine by giving visual indication and ringing audio alarm. Offered annunciators are manufactured with the assistance of professionals in accordance with the established quality standards.